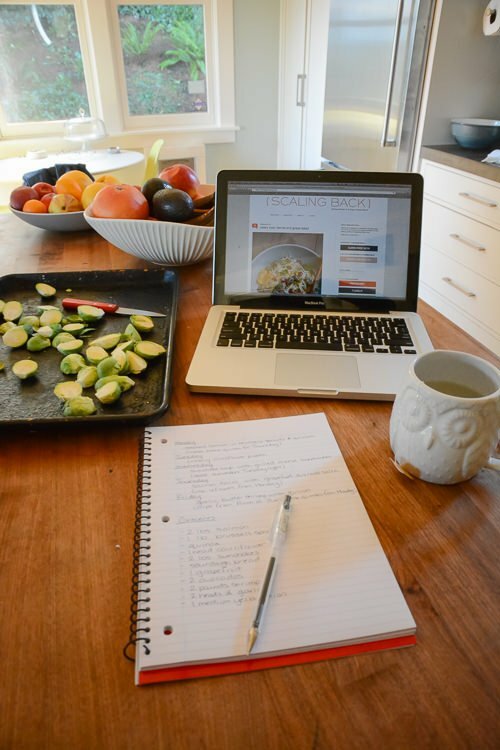 Meal planning is one of those things, either you do it or you don’t. But I am here to tell you that if you try this, it will save you so much time, money and stress. And really, isn’t that what we all want? Sort through what you have in the house already and see if there’s anything that you need to use up. While you do this, wipe down the shelves in your fridge and throw out anything expired. 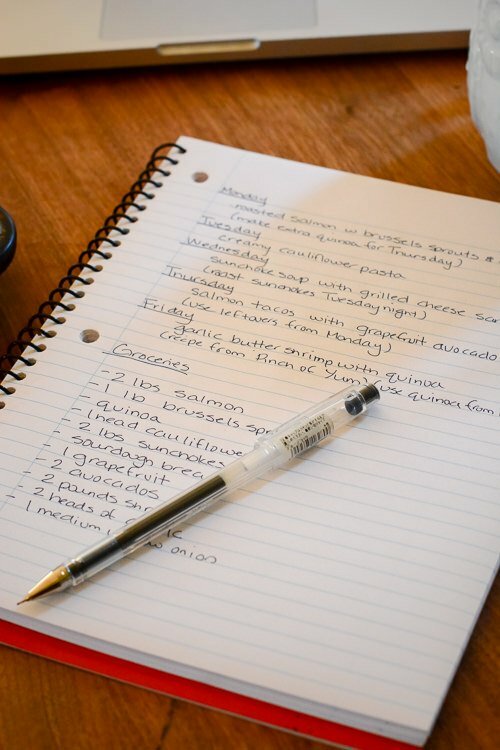 Sit down and write the days of the week that you need to make dinner at the top of your paper. Then go to your favorite food websites (like Scaling Back of course!) to find meals that sound good for the week. For example, Monday I’m going to make roast chicken and vegetables so I would write that at the top and then list all the ingredients I need. Then, I’ll chose a meal later in the week that I can use the leftover chicken for, like chicken and cheese enchiladas. Make sure to add everything that you use during the week like milk, coffee, butter, toothpaste, etc. Don’t forget about school lunches and any extra food you might need for playdates or having friends over. Take your list and a pen and get shopping! This will be your one and only trip to the store this week, so have fun. Make sure to post up your final meal plan so you know what you’re making each night. I just put up a little post it on my calendar but there are lots of cute printable meal planners out there too. Each week that you do this it will get easier and easier, I promise. And without making those multiple trips to the store, you’ll have extra time and money for you! Your 30 recipes for January were fantastic and such a huge help to me when trying to change my diet to super healthy. Especially loved the creamy cauliflower pasta and the veg chilli. Love your kitchen and owl mug in this post. Any chance of some more pics of your kitchen?! Thanks so much for reading the blog and trying some of the recipes. A kitchen tour is a great idea. As soon as I clean it up I’ll try and take some photos! I do have a problem with my kitchen being a little bit dark but I’ll see what I can come up with. Thanks again for the kind words and good luck with the healthy eating!